Low vision clocks help those with macular degeneration to keep track of time and sometimes, date and day, by using easy to see large, bold numbers or by hearing the time and date. Use of large number or talking aids for those with macular degeneration will help to reduce some of the frustration of visual impairment that comes with the loss of central vision. Determine where the clock will be used. When my father-in-law got up in the middle of the night he would have to put his face right in front of their bedroom clock to see the time. Now with this large number clock - numbers light up on a black background - he can see the time from a short distance. There are times when all of us can use a reminder as to what day and date it is. Everyone's vision needs are different. For some people this color combination of stark white numbers and letters on a dark black background provide the best contrast for seeing. It also displays the time, month and day of the week, in large, bold numbers/letters. It measures 8.5" wide x 6.75" high x 1" deep (4.5" deep with Kickstand) and features an 8" screen. 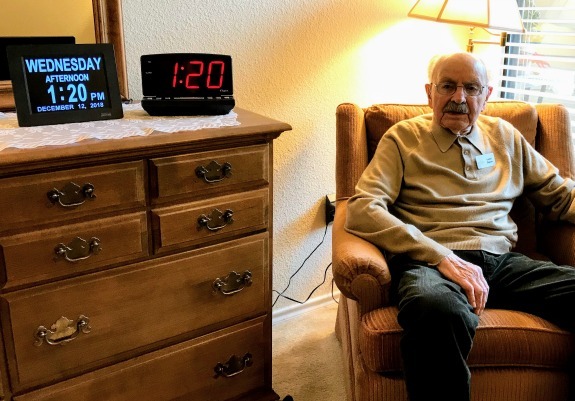 My father-in-law who has wet macular degeneration finds these large number clocks helpful for keeping track of time so that he gets to the dining room in time for his evening meal. Just press a button and in a loud voice, hear what time it is. This one works well for those who rely on the talking voice feature. The large blue button is easy to see - just press it to get your time. However, if the other smaller buttons are accidently pressed one may have to reset the clock for time, AM/PM, etc. 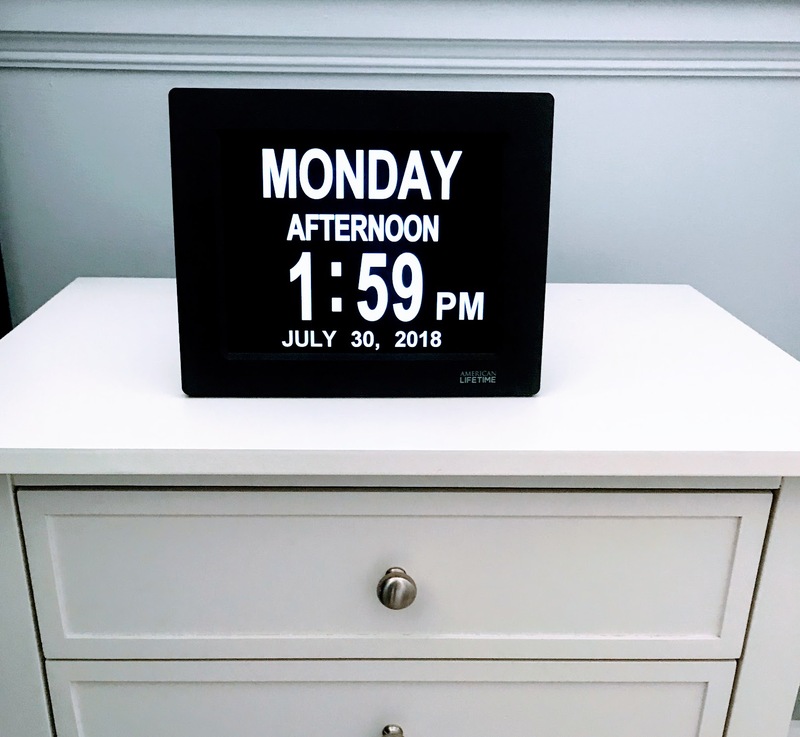 You don't have to worry about pressing the wrong button and accidentally resetting the time or day with this talking clock. The clock will speak day, month, date and year and announces the time every hour. The clock measures 2 3/4" x 2 3/4" x 2 1/4" and requires 2 AA batteries (not included). 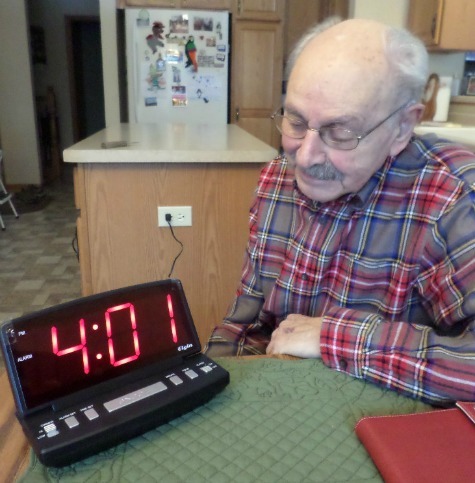 Checking the time need not be an exercise in frustration with the use of low vision clocks that offer large easy to see numbers, contrasting colors and/or a talking feature to hear the time.